A high school student at puts the finishing touches on his solar car at SMUD solar car competition on May 6. 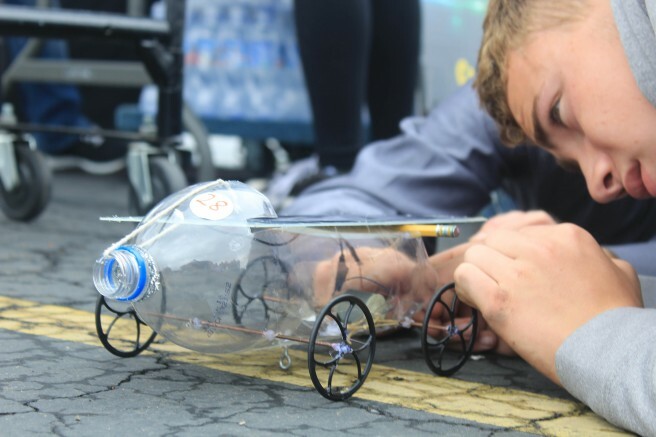 The Sacramento Municipal Utility District (SMUD) hosted its twelfth annual solar car race for local high school students at American River College on Friday. The event is a partnership between SMUD, ARC and the Solar Schoolhouse Project that focuses on education pieces centered around the science, technology, engineering and mathematics (STEM) fields. SMUD public information officer Jonathan Tudor said that SMUD employees from the Energy Technology Education Center work on events like this one to educate the community on energy. Tudor said that this specific event is also seen by SMUD as a way to educate youth. ARC public information officer Scott Crow said the college is “proud” to partner with SMUD. Most students like Nick Rebholtz, a sophomore at El Camino high school, created unique designs for their solar cars. Many of the students solar cars had trouble getting going because of the dark cloud cover. “We’re in a class called pre-engineering and this is one of our projects that we’re doing,” McGinnis said. Be the first to comment on "SMUD partners with ARC for solar car race"